Dr. Huey Percy Newton (February 17, 1942 — August 22, 1989) was the co-founder and longtime leader of the Black Panthers, an organization created to defend African-Americans and their communities from racism, while fighting for civil rights and self-improvement. He was also involved in various violent incidents throughout his life, including the alleged shooting of an Oakland police officer, and during his later leadership of the Black Panthers it has been alleged that they resembled a mafia more than a civil rights group. Both during his life and after his death, Newton was a very influential figure in African-American communities. His cousin, Stanley Clayton, was one of the few people to escape mass suicide of Jonestown cultists. 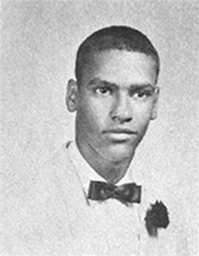 Huey Newton was born in Monroe, Louisiana, to Armelia and Walter Newton. His mother was a sharecropper, and his father was a Baptist minister. He was named after the quasi-socialist/populist governor, Huey Long. His family moved to California when he was still very young. He attended school, but was still illiterate. Newton was determined to educate himself and, despite his poor literacy, read Plato's Republic until he understood it. As a teenager, he was arrested many times for petty crimes (including arrests for both possession of a firearm and vandalism before reaching the age of 14), but attended college. He robbed houses to support himself while studying law to become a better burglar. While attending Merritt College, a community college in Oakland, California, he became very involved in radical politics. He read the works of Marx, Lenin, Mao, and Che Guevara, among others, but was especially drawn to the writings of Malcolm X. He lobbied the school to offer the first ever black history course, and with his friend Bobby Seale, he founded the Black Panther Party. After a coin toss, Seale became chairman, and Newton Minister of Defense. Seale and Newton were very active in recruiting African-Americans into their new organization, and within a year, were a notable force within the Bay Area. Within a year, the Panthers were running armed patrols in their neighborhoods to both protest and protect against, among other things, unchecked police violence. During this time (1968-72), the FBI's COINTELPRO was very active in targeting the Panthers, killing many and arresting many on trumped-up charges. One result of the turmoil was an increase in Newton's personal power within the party as other leading figures were incapacitated by legal troubles or death. In 1971 Newton announced a strategic shift, moving away from armed confrontation towards community projects such as the free breakfast program and Community School. These projects were enthusiastically embraced, receiving support from many large donors and grant support from the State of California. Newton would later be accused of embezzling $600,000 of State aid to the Community School, eventually pleading no contest to a lesser charge of cashing a $15,000 check from the State for his own use. Newton was convicted of assault with a deadly weapon for stabbing some guy multiple times with a steak knife in 1964. Three years later, he was in a car pulled over by a member of the Oakland police; the officer called for backup after recognizing Newton, and as another officer arrived for backup, shots were exchanged. The first officer was killed, the guns were disappeared, and Newton claimed not to remember anything. The first trial resulted in a conviction for manslaughter by an all-white jury, which was reversed by a higher court which also ordered a new trial. After two mistrials, the district attorney decided not to pursue the charges any further, and they were dropped. Newton was charged with the killing of a woman in 1974, allegedly over her use of the childhood nickname "Baby". He was also charged with assaulting his tailor, allegedly over the same use of said nickname. He posted bail and fled to Cuba, staying there until 1977 to avoid these two charges. An assassination attempt was made on a key witness for the murder charge, one which resulted in a disastrous raid on the wrong house by three black panther members. One was killed, and the other two injured in the shootout. Following this raid, the black panther medic who treated the two survivors was shot and buried in the desert, in an alleged attempt to cover up the failed assassination of the witness, but survived and later told police that two black panther members were behind his assault. Newton denied any involvement. Newton returned to the US in 1978, and more or less beat the charges he fled from in 1974. The tailor recanted on the assault charge, two juries deadlocked on the murder charge, and Newton walked away from the whole mess with only two convictions for possession of illegal firearms. In 1982 the years of fund-skimming from Panther community projects caught up with him, and after his plea of no contest to cashing a $15,000 check of State money for personal use, he spent 6 months in jail. Newton graduated from UC Santa Cruz in 1974, and enrolled as a graduate student in 1978, after he returned to America. He eventually earned a Ph.D. in "History of Consciousness", and wrote his dissertation on the Black Panthers. On August 22nd, 1989, stepping out of a crack house in Oakland, Newton was murdered by Tyrone Robinson, a drug dealer and member of the Black Guerrilla Family. Robinson contended that Newton drew his weapon first, but there was no evidence found that Newton had been armed. The killing occurred in the same Oakland neighborhood where Newton had once set up social programs for African-Americans. Newton's last words, as he stood facing his killer, were, "You can kill my body, but you can't kill my soul. My soul will live forever!" He was then shot three times in the face by Robinson. ↑ Amy Sonnie and James Tracy. 2011. Hillbilly Nationalists, Urban race Rebels and Black Power: Community Organizing in Radical Times. Brooklyn, NY: Melville House. p. 190. ISBN 978-1-935554-66-0. This page was last modified on 15 January 2019, at 19:02.